By default this wizard runs each time a client application starts unless it is intentionally configured otherwise. It allows you to start monitoring your resource(s) in a few clicks. 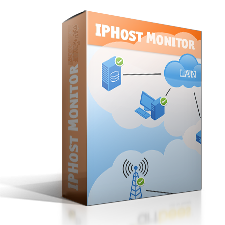 The “Quick Network Discovery” button launches network Discovery in the IPHost Network Monitor host’s local network. You can create your monitoring configuration skeleton in one click. 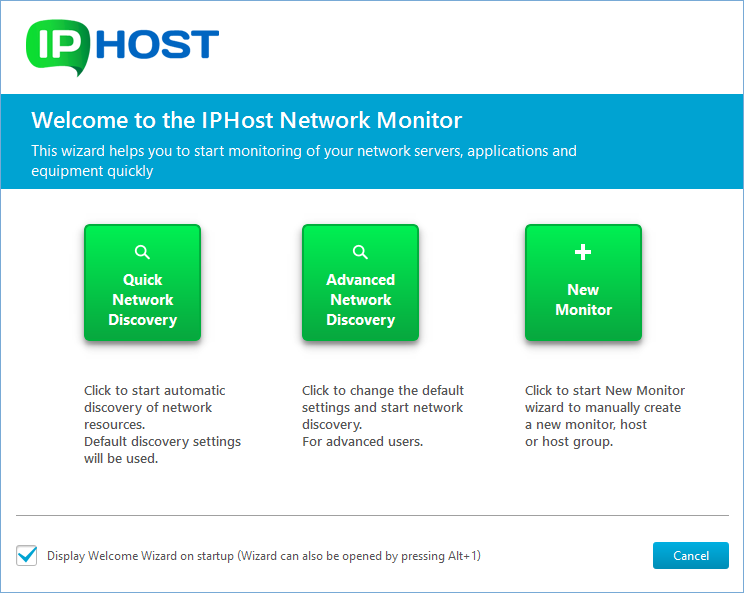 The “Advanced Network Discovery” button opens the Discovery Wizard that allows you to customize settings and start custom network discovery. You should use it if you want to specify explicitly a set of hosts to scan and/or resource types for the service to search during the discovery. The “New Monitor” button launches the New Monitor Wizard, so you can manually add resources you want to monitor and modify their monitoring parameters. The Cancel button closes the wizard, to re-open it again press Alt+1. If you don’t want to see the Welcome Wizard next time the client application starts, then simply uncheck the Display Welcome Wizard on startup checkbox at the bottom of the wizard. This dialog appears right after the Welcome Wizard finishes its work. Most messages are sent to the Administrator e-mail address, although you can specify other addresses instead or in addition to it. To be able to receive these e-mail messages you should specify your SMTP server and e-mail address. If your SMTP server requires secure connection, you must specify credentials and a connection type. You can close this dialog and enter this data later via the Settings dialog.